However, selecting the right foods is just the beginning, you must also consider how to create a healthy plate at each point throughout the day along with learning how to structure those healthy foods properly for optimal success. How and what you eat depends on the time of day that you are doing your workout sessions. This is the time of day when you are going to be performing the most energy intensive activities and the time of day when you want to be focusing your intake around the foods that provide the energy you will need. 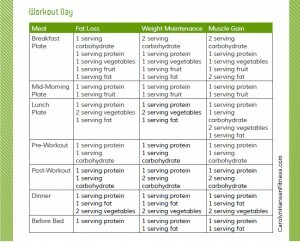 Another consideration when structuring your daily plate schedule is your goal. You’ll eat slightly differently depending on whether you are working to build muscle mass, weight maintenance or fat burning. If your goal is to burn fat, your total energy intake needs to be lower than what you burn off each day therefore your plates will have to reflect lower calorie choices and lower energy overall taken in. The difference in energy taken in should come primarily from carbohydrates and fat rich foods. However, you do not want to reduce protein intake regardless of what your goal happens to be. 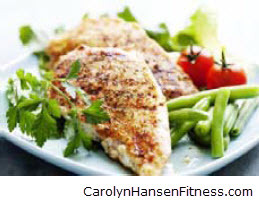 Protein is the one constant that must remain in your diet regardless of your goal. In fact, your protein needs usually go up slightly when dieting so you’ll want to eat a little more of them and slightly reduce the fat and carbohydrate rich foods in your diet. However, if your goal is to build and tone muscle tissue, you need to eat a few additional calories over and beyond what you normally would because you need that extra energy to complete the muscle building process. Your body will have a hard time gaining any muscle strength or size without these additional calories added. As the volume of your muscle building workouts increase you will require additional fuel. When building muscle and adding calories, your best bet is to add those calories right around the workout period or as close to it as possible because this is the time the body is most likely to use them up for muscle mass building rather than converting them to body fat storage. 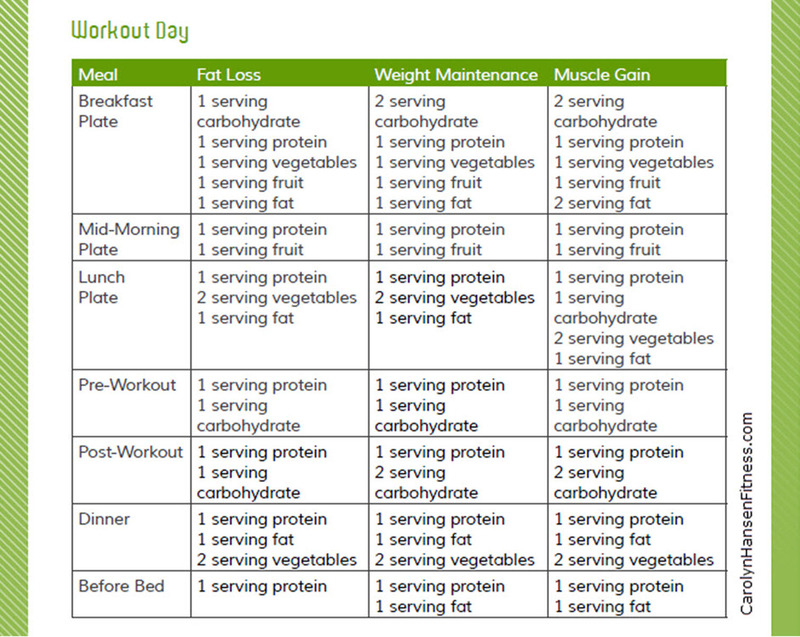 Included below are two tables, one for workout days and one for non-workout days. 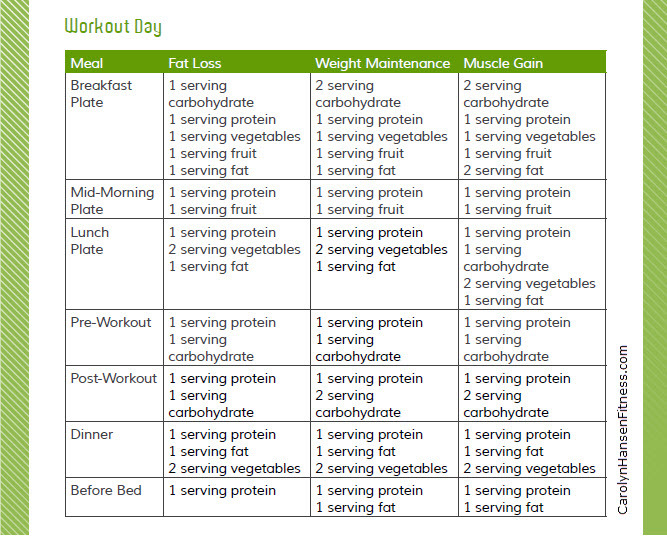 Each table has three different columns…one for fat loss, one for weight maintenance and one for muscle building. They reflect general levels of food intake for the “average” individual target body weight; for women around 130-150 pounds and men around 160-180 pounds. These may need a bit of adjusting depending on your own personal body weight and activity level. These reflect your target body weight…so, if you are looking to lose weight and weigh 200 pounds then it shows the proper food intake because it’s designed for someone who is standing at 160-180 pounds. However, if you are already at this weight and want to either gain or lose weight (in which case you are moving outside of the target range) you will need to adjust the plan. Another important point to remember is that servings will be slightly different depending on whether you are male or female so be sure you are adjusting your food intake accordingly. Don’t beat yourself up over these tables…they are meant to be flexible to fit your lifestyle. Just try your best to follow them as you go about your day but understand that it is impossible for anyone to be 100% all the time. If for example, you are dining in a restaurant and unable to get a healthy source of carbohydrates then simply skip that meal and serve it at the next. In my “Minimalist Exercise and Nutrition Program” I coach you on how to maximize both the efficiency and the effectiveness of what you are doing in both the gym and the kitchen.